Why should you eat low carb foods? If you want to stay healthy or lose weight, or if you have health problems or type 2 Diabetes that can be reversed with carb-free foods, this is a great incentive to include foods like this in your daily diet. Since we’re talking about vegetables, you can pretty much eat your fill, until you’re not hungry anymore. You won’t have to count calories or figure out how much you can eat without going over the number of carbs you want to limit yourself to, each day. Low carb diets restrict starches like bread and pasta, and sugary foods. Instead, you’ll be eating tasty real foods like natural fats, proteins and veggies. Diets low in carbohydrates have been used for decades, and many people have had success with them, in becoming healthier and in losing weight, if that was their goal. Carbohydrates, taken in moderation, play a vital role in the maintenance of a balanced daily diet. They give your body energy. If you want to be more careful about how many carbs you eat every day, you need to know which vegetables and fruits are the lowest in carbohydrates. We are also including the amount of carbs in common vegetables, so the information will be easy for you to find. Leaves Leafy veggies contain the fewest carbs. They also are full of fiber, so they don’t heavily impact your blood sugar level. They are rich in phytonutrients, vitamins and minerals. Some leafy vegetables include spinach, Swiss chard, herbs and lettuce. Flowers & Stems These have a low content of carbs, although they have more carbs than leaves do. Flower and stem vegetables include asparagus, mushrooms, cauliflower and broccoli. “Fruits” The “fruits” of plants are parts containing seeds. Fruits have moderate levels of complex carbs. 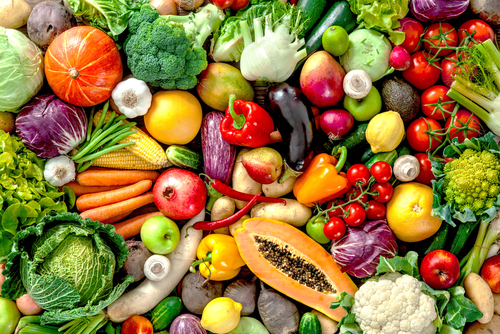 Some fruits in this category include tomatoes, okra, green beans, eggplant, peppers and squashes. Roots In these four groups, roots have the highest carbohydrate level. Some of these include white potatoes, yams, sweet potatoes and parsnips, and they all have high starch and carbohydrate levels. Some other “roots” include radishes, carrots and celery root, but they have lower levels of carbs than the first roots in this category. Asparagus This tasty vegetable has five grams of carbs and just 27 calories in a one-cup serving. The stalks offer vitamin A and vitamin K. Choose bunches with compact heads and bright green stalks. Break off the whitish ends before you cook and eat them. Cauliflower This isn’t the most popular vegetable, but it’s too healthy to overlook. It is an excellent source of vitamin C. In fact, one serving gives you more than half your daily vitamin C requirement. You can eat cauliflower cooked or raw. Roasting and steaming are the best methods for cooking this valuable veggie. Brussels sprouts These are low in carbs and high in fiber, vitamin A, vitamin C and folic acid. Researchers believe that its nutrients can help in fighting off some types of cancer. Spinach This is a leafy green veggie, full of iron, vitamin K, folates and beta carotene. It is a valuable part of a proper diet for diabetics. To get the most nutrition, purchase it frozen or fresh, not canned. You can use spinach in omelets or as the base for salads. Cabbage This veggie is low in carbs and rich in vitamin B6, manganese, vitamins C and K and antioxidants. When you choose cabbage, select a head with shiny leaves and firmness when you touch it. Refrigerate cabbage to keep it fresh. Cucumber One cup of cucumbers contains fewer than five grams of carbs. They have vitamin C, vitamin K and potassium, making them a healthy salad or snack option. You can eat them by themselves or put them on sandwiches. Broccoli Broccoli is loaded with iron, fiber, calcium, vitamin A, vitamin C and vitamin D. Choose broccoli that is dark green in color. It doesn’t keep very well, so enjoy it soon after you purchase or harvest it. Tomato Tomatoes are low in calories – only 32 calories in one cup – and low in carbs, too. They are packed with fiber, potassium, vitamin A and vitamin C. They also have lycopene, a powerful antioxidant that helps protect your body against heart disease and prostate cancer (for men). You can enjoy tomatoes raw or use them cooked in sauces and with healthy meats.